This Easy Lemon Garlic Basil Baked Shrimp takes less than 20 minutes to make because we use a fantastic kitchen shortcut: Dorot garlic and herbs. These little cubes of deliciousness can be tossed into your favorite healthy recipes to #ElevateYourPlate and deliver maximum flavor—with no prep or cleanup! So, you want yummy, healthy meals that taste fresh and amazing but don't leave you chained to your cutting board? Then let me introduce you to the fabulous kitchen shortcut that is Dorot. 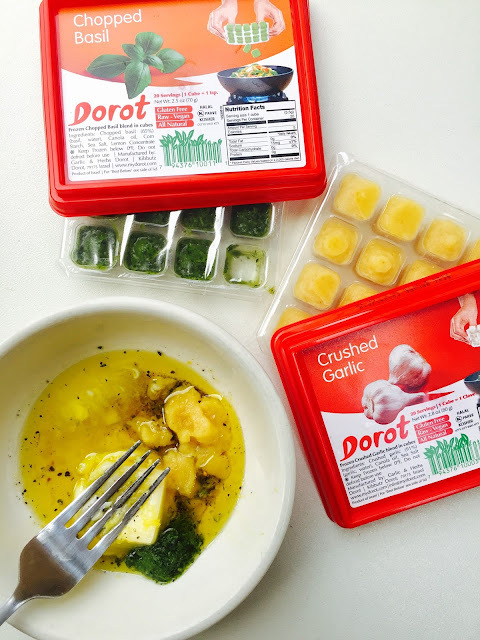 Dorot is fresh garlic and herbs that are frozen into cute little cubes—you can store them in your freezer for up to two years. Dorot pre-portioned garlic, onions, and herbs eliminate chopping and measuring, making it effortless to season and flavor your cooking. Dorot is picked fresh and flash-frozen on site to lock in freshness. It is all natural, raw, and vegan; it contains no preservatives or artificial flavors; Dorot is also kosher, halal, non-GMO, gluten-free, dairy-free, nut-free, and soy-free. What more do you want? It’s basically having fresh herbs at hand without having to actually grow or chop them! 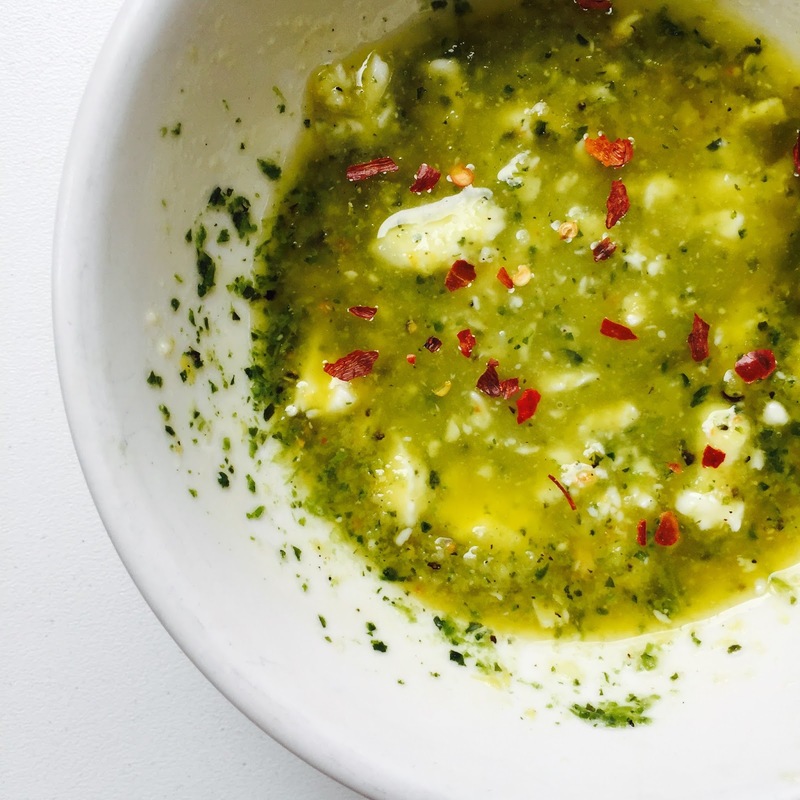 If you're interested in trying out these simple and delicious garlic and herbs—and OF COURSE you are—head on over to the Dorot website and download a $1 off coupon now. I get mine at my local Stop & Shop supermarket. 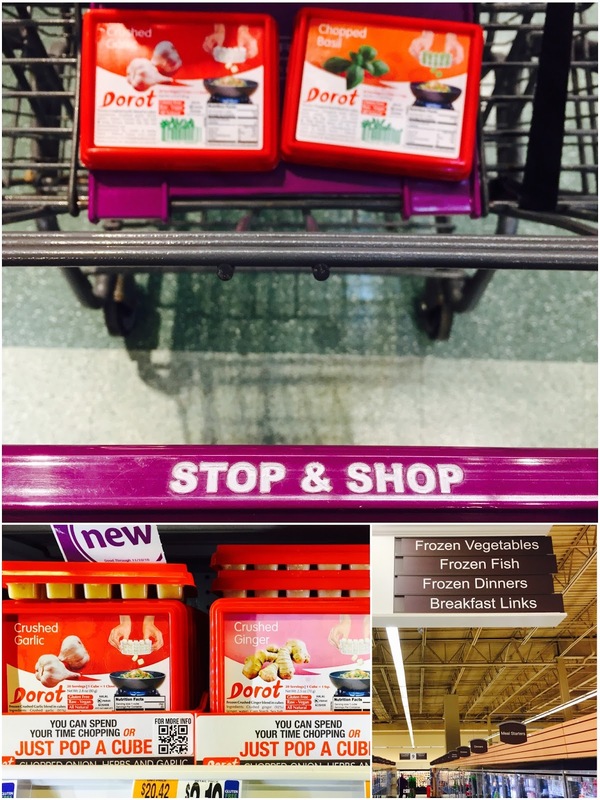 You'll find Dorot garlic and herbs with the frozen veggies! 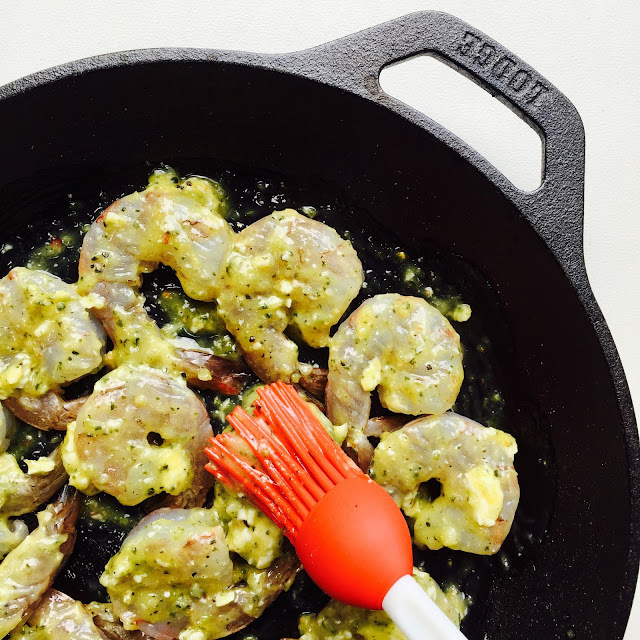 Now that you've downloaded that coupon and bought your super easy Dorot garlic and basil, you're ready to make this delicious Easy Lemon Garlic Basil Baked Shrimp! I know shrimp seems fancy and like it should just be for special occasions...but when it's this quick and simple, you can make it any ol' time. 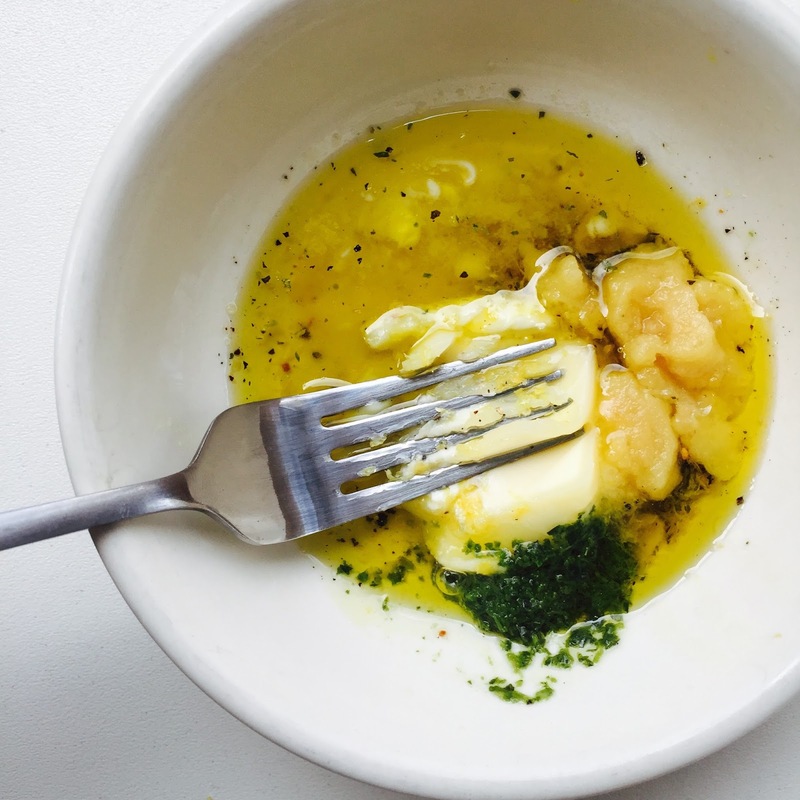 In a small microwave-safe bowl, add olive oil, butter, lemon zest, garlic, basil, and salt and pepper. Heat in the microwave until butter is a bit softened and garlic and basil are partially thawed, about 15 seconds or so. Mash everything together. It doesn't need to be smooth. Brush about a third of the mixture onto an oven-safe skillet (I used my trusty Lodge cast iron pan). Place the shrimp in a single layer in the pan. Brush the rest of the garlic-basil-lemon mixture over all of the shrimp. Bake until the shrimp are pink and opaque throughout and the butter mixture is bubbling, about 10 minutes. Squeeze half of a lemon over the shrimp while they're still hot. 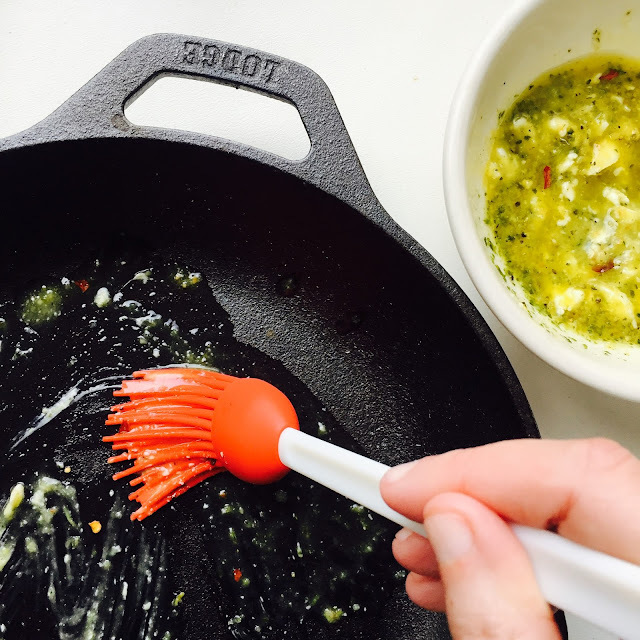 Serve warm, right from the pan. It would make a perfect Superbowl appetizer! Or serve these shrimp over some pasta (or spaghetti squash) for a scampi-style meal. Or chill the shrimp and use them to top your favorite green salad. When it's this easy, you'll make this dish again and again! If you're ready to #ElevateYourPlate don't forget to grab your Dorot coupon now! This shrimp looks so good and I love how quick and easy it is! Delicious! Easy recipes are the best and shrimp in garlic smells so good while cooking. 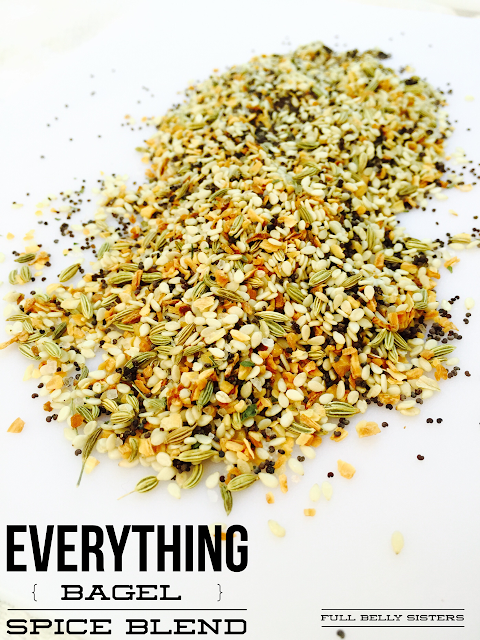 Dorot herbs are so convenient to have on hand. Perfectly portioned too! These shrimp look great! Totally my kind of dinner - easy and yummy! Thanks for the coupon to Dorot too- I love them and especially their garlic! Yum! Bright, light & delicious, this looks amazing!! Loving the ease of this recipe!! Thank you! Love easy recipes like this!! When I found these in the freezer section I was so excited. Fresh herbs are so expensive here but I have a black thumb and can't grow anything!! I have tried to have so many herb gardens but never worked. I often steal fresh herbs from my friend who grows so many in her yard effortlessly. Thank goodness for that! These shrimp look amazing!! I need to find me some of this Dorot garlic! I love this! I've downloaded the coupon and the store locator says that they are in stock in Columbia. (50 miles away) Maybe I can find it closer! I still travel 25 miles to the closest supermarket, so it's no big deal to travel if it's worth it. It look like a huge time saver in the prep work! Thanks for the info Justine! Your recipe looks easy and delicious, and I love the convenience of the Dorot cubes! What an awesome idea ... I love the idea of those Dorot cubes. Your shrimp sounds fabulous.